Something I am notorious for doing when I go out to eat is asking our waiter or waitress what their favorite dish is. I am always on the hunt for that crave-able dish. You know, that irresistible item on the menu that you simply must try – especially if you’ll only be there once. Or, if you have the pleasure of going back again and again, then it’s the dish that keeps you going back for more. 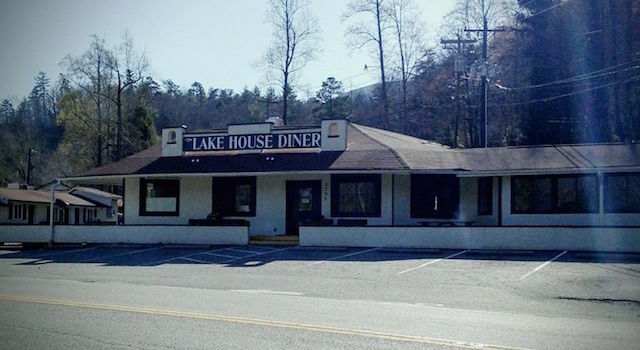 While we are certainly not known as a “foodie” destination, I was determined to uncover the favorite dishes, crave-able creations, claims-to-fame and what locals love about Lake Lure dining. 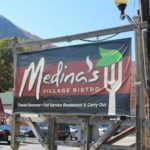 So, my husband and I decided to eat our way along 74A (well not quite that literally). 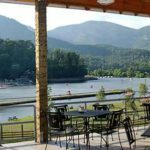 I also polled all our local friends for what they love about Lake Lure dining and got fan favorites submitted via Facebook. 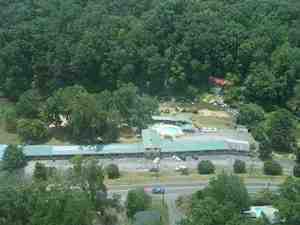 What I learned is that our locals enjoy the Lake Lure dining establishments for many reasons. Sometimes it’s the crave-able dish that locals love. Sometimes it’s the beautiful view or the atmosphere or the hometown hospitality of the folks that run the place. Our hope is that this list helps you experience the area the way locals do. 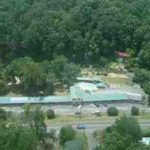 And if you are a local, then we hope you find this list helpful as you branch out and explore all our Lake Lure dining options. 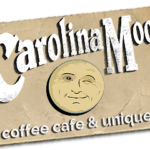 For reference purposes our list of restaurants is sorted from East to West along 74A (aka Memorial Highway, Main Street) … so you could literally eat your way along 74A and go from one place to the next to temp your taste buds and have a great time. 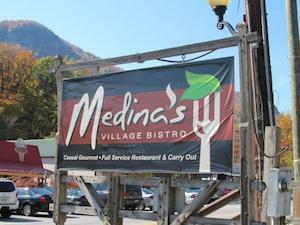 Locals Love: The Mountain Trout dish and the homemade salad dressings are most talked about. Oh, and given the name … they’ve got a nice view. 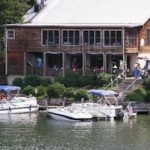 Locals Love: The view is a favorite of course and the boat-able access makes it a favorite destination while boating the lake. The ribs are raved about and the Macho Nachos were mentioned by several people as a great appetizer. They also have a Mother Load Burger that’s 1-1/2 pounds of beef! If you eat it all you earn bragging rights and they’ll give you a t-shirt. 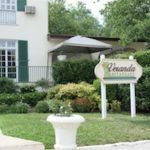 They also do a series of Locals Nights and Wine Tasting Events throughout the year that are always lots of fun if you get a chance to go to one of them. 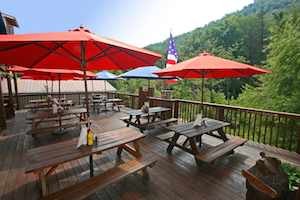 Locals Love: The outdoor patio with the beautiful view of Lake Lure. This is a great way to spend a beautiful afternoon. There’s a broad menu of Italian favorites. The Italian Nachos are a yummy twist on a traditional favorite. 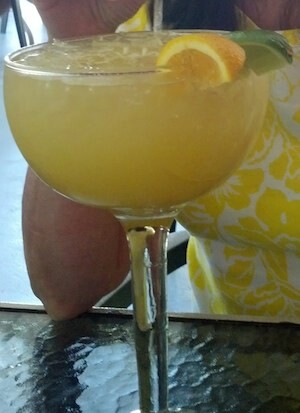 Locals Love: The Grande Margarita is a crowd-pleaser and it’s big enough to quench the thirst of a crowd. It’s huge – the size of a fishbowl and I’m not exaggerating. 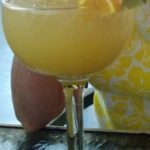 The margarita goes great with the chips and salsa that quickly arrive at every table. The fajitas are delicious and they have several interesting fajita varieties to try that are beyond the ordinary. Locals Love: The Sunday Brunch. It’s always a treat with a huge assortment of sumptuous options including appetizers, entrees, salads, desserts and more. There’s also a “Build Your Own Bloody Mary Bar” from 12-2pm. Locals Love: Good eats at a good price! Just as a diner should be. The patty melt and hand cut chips is a mentioned favorite along with their burgers. 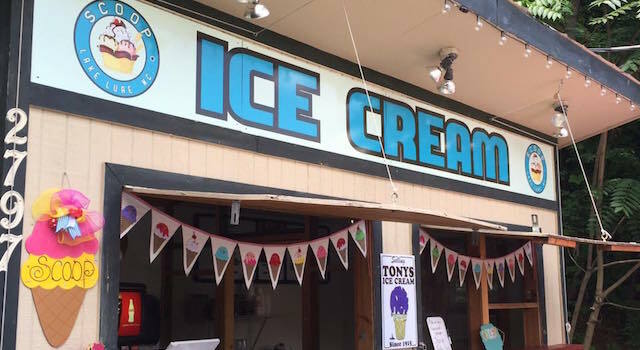 Locals Love: The delicious locally made Tony’s Ice Cream is a creamy, dreamy, delicious treat and your furry, four-legged friend can enjoy a mini scoop too in this great dog-friendly place. 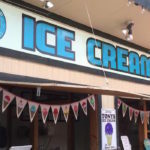 The grape ice cream is their signature special. The coffee drinks are great too and they’ve always got seasonal specials. 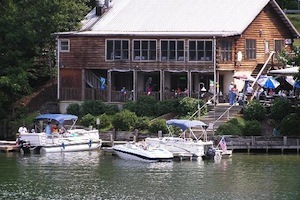 The fun outdoor location across from the beach has nice views of Lake Lure and is accessible by car, foot and even by boat. 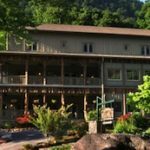 Locals Love: The cozy, coffee-house atmosphere, the custom / private coffee blends – Lake Lure Blend, Chimney Rock Blend, Bat Cave Blend – and the hand-crafted items made by local artists that are available for purchase. Locals Love: The extremely casual, riverside atmosphere complete with swimming pool, horseshoes, volley ball and people floating in the river on tubes. 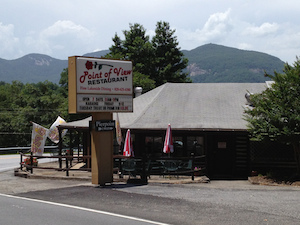 It’s a great way to enjoy a pretty day and take in the view of Chimney Rock. 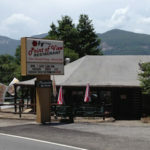 They have nightly specials and delicious burgers that are served with homemade chips or fries. You can also always count on them to be open — in season, off season and even holidays. Locals Love: The recent expansion and the full bar area. 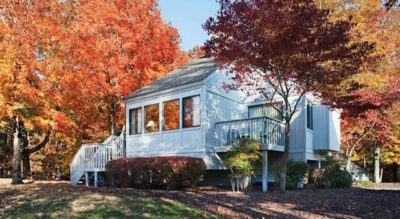 There is also a new outside covered deck space with great views of the Rocky Broad River and Chimney Rock. Their full-service bar has over 50 local, craft and domestic beers to choose from. 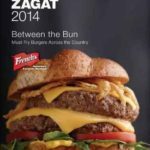 The smell of their burgers cooking on the grill up front is what draws you in and is the menu item most talked about. It’s a nice post-hike pit stop. Locals Love: The burgers! 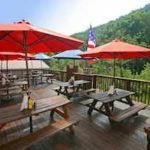 They are made with with Hickory Nut Gap Meats’ 100% grass-fed beef and the burger has critical acclaim. 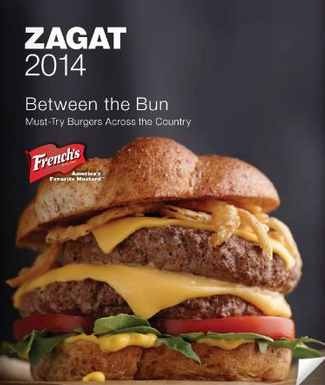 The burger was recognized by Zagat, a national restaurant review company – 2014 Zagat-rated “Must-Try Burgers Across the Country”. I also think their Turkey Classic sandwich and homemade chips is simply delicious. 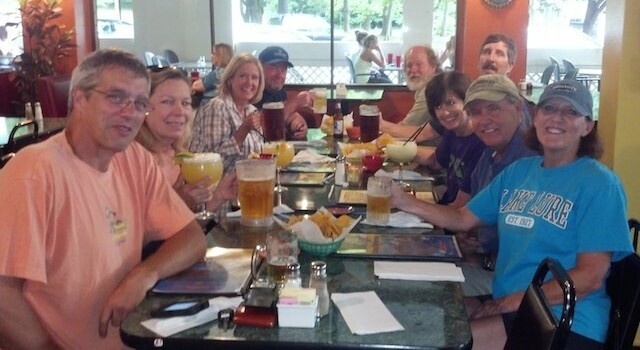 Another nice post-hike, Lake Lure dining pit stop. 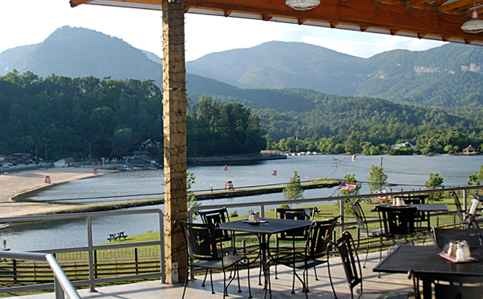 Locals Love: One of the most talked about Lake Lure dining dishes is the Roasted Red Pepper and Gouda Soup. It is raved about and is almost legendary in these parts. I heard how delicious it was from so many people and that’s what got me in to try the place. I see what everyone was talking about. Actually, anything that John makes is delicious. 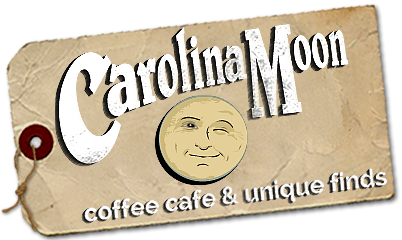 Another favorite is their Cinnamon Rolls that are so delicious they have been featured in National Geographic Traveler Magazine and Southern Living. Locals Love: The steaks. 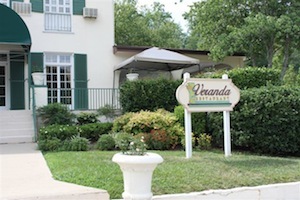 It’s also great if you are looking for a finer-dining experience or a place to enjoy a special occasion. 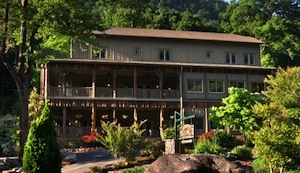 Thank you to everyone who helped me discover an impressive assortment of down-home delectables and fun little spots to … enjoy a good drink, have a home-cooked meal, take in a stunning view, lounge by the lake, float down the river, meet-up with locals, make a post-hike pit stop and get my toes tapping with some great live music. 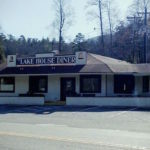 Enjoy the Lake Lure dining options and have fun eating your way along 74A! Please share other favorites with us via the comment area below. Thirsty? We got you covered with our Beer Lovers List of Area Favorites & Asheville Breweries which are kid and dog-friendly.